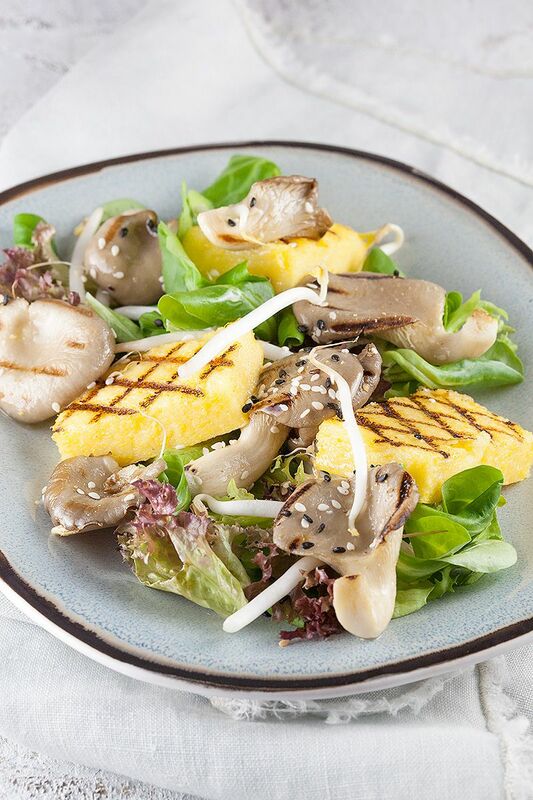 Mushrooms are great for autumn, so try our colorful and tasteful oyster mushrooms and polenta salad this season! Ready in 20 minutes, serves 4. Bring 2 cups of water with salt to a boil in a medium-sized pan. When the water has start to boil, add the polenta en mix well using a whisk. Turn down the heat and let it simmer for the time according to your package. There’s all kinds of polenta, so every kind needs its own cooking time. The one we used, only needed about 10 to 15 minutes. You’ll notice the mixture thickens and will start to bubble. That’s great! Keep on stirring it so it won’t burn. Season with butter, grated Parmesan cheese, pepper and salt. COAT a square container or oven dish with tin foil and pour in the polenta. Make sure the surface is flat, you’re going to grill pieces of it later on. Wait until it reached room temperature before refrigerating it for at least 2 hours, or until completely set. 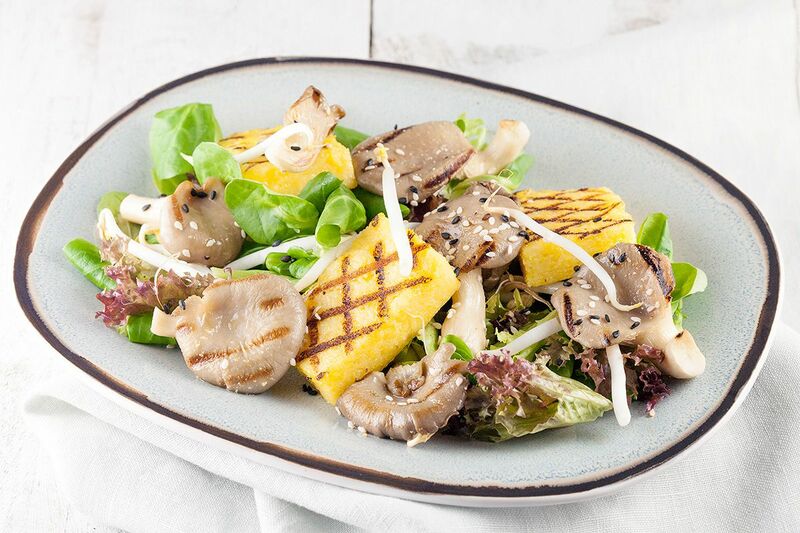 CREATE a quick and delicious dressing by combining tarragon vinegar with pepper and salt. Then slowly DRIZZLE in the hazelnut oil and whisk immediately so it mixes well. DIVIDE mixed greens over 4 plates and heat up your grill pan. CUT the polenta into squares, triangles, anything you like. BRUSH both sides with olive oil and grill them until you’ve reached the grill pattern on both sides. 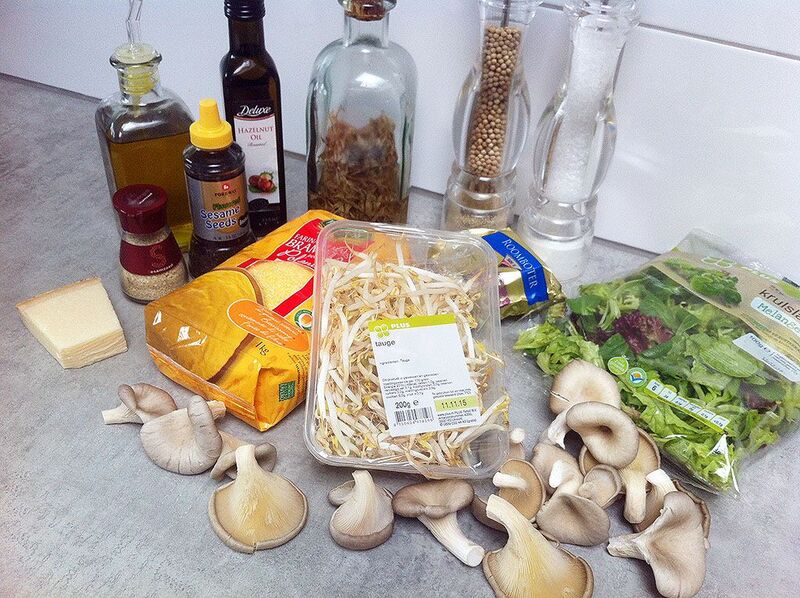 Also BRUSH the oyster mushrooms with olive oil, don’t tear them into pieces but choose smaller ones instead. GRILL the mushrooms very shortly on both sides, remove from the grill and season with pepper and salt. 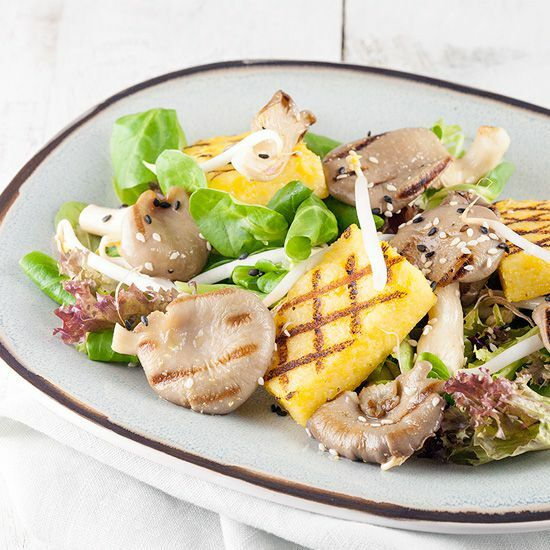 DIVIDE grilled polenta and mushrooms over the salad. FINISH it off with the dressing, bean sprouts and sesame seeds. Enjoy!